His revolutionary idea uses phones to counteract phones. Prumt explains, “The only way to stop a bad student with a phone is a good student with a phone.” When one student is distracted by the ping of a text, his or her classmates are trained to pull out their own device, locate the perpetrator, snap a photo of the student abusing his phone, and tweet it to the proper authorities. This method of limiting cell phone distraction in is stark contrast to the method used at Outback High School. 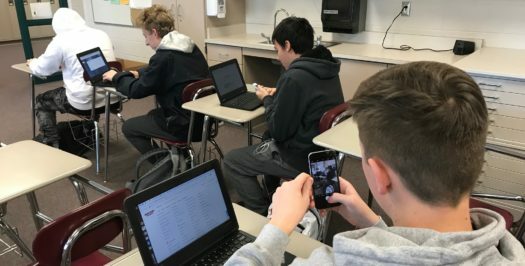 After noticing a striking correlation between slipping SAT scores and cell phone usage in class, Principal Scotty Morris decided to ban the devices entirely from the classrooms. Since then, test scores have shot back up, as has the teachers’ sanity. After the announcement, some teachers and parents have taken to the streets in outrage. At a march on Saturday, protesters expressed their frustration and disbelief. “It’s absolutely ridiculous. Verizon is pouring money into Prumt’s pockets to be the voice of this campaign. He doesn’t care about our students, just his paycheck,” teacher Charles Schumaker pointed out. Prumt neglected to comment on the protest, seen driving past in his Bentley Mulsanne, which notably had a large Verizon logo on the side.